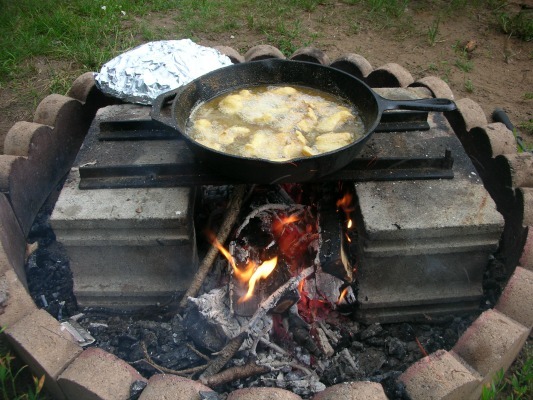 Have you thought about cooking fish over a campfire but didn't know how? Good news.......it's easy and it's fun! Nothing is better than a hot fish filet cooked over an open fire. A little salt and maybe a little hot sauce? It's mouth watering. Plus, cooking the fish outside eliminates that undesirable oily mess left behind in your kitchen after you're done. Lets face it, frying fish is messy. Why not take the mess outside and enjoy a nice cookout instead of worrying about how much grease is splattering around your stove? To make things easy we've developed a few simple guidelines and suggestions for creating the perfect campfire meal.....fried fish! When it comes to cooking fish over a campfire the setup and the fire you build is very important. Fried fish needs HOT oil. Trying to cook over a fire that smolders and sizzles just won't work. You need dry seasoned firewood that creates a hot fire. 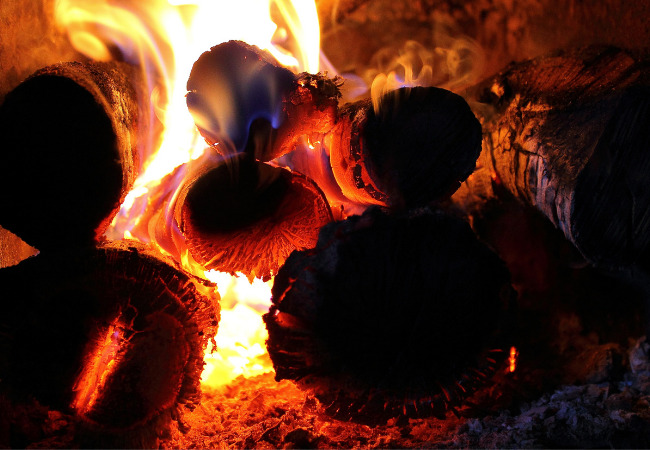 Before you start to cook, gather a decent supply of dry firewood cut into small pieces. The small pieces make it easier to control the temperature of the oil. Although it's pretty basic I've found 2 cement blocks with 2 pieces of angle iron between them creates the perfect cooking platform for fried fish. I just make sure the surface is level, then build a hot fire between the two cement blocks. Once I have a nice hot fire started, I set the angle iron using a pair of tongs and you're ready to cook! A campfire grill, tripod grill or other similar setup will work just as good. I just use the cement blocks and angle iron because I had them laying around. A cast iron skillet is also very important. The cast iron creates an even cooking surface eliminating hot spots commonly found when cooking over wood. Sure, you can cook with a normal skillet but the results are a lot better when you use cast iron. Whether you're cooking perch filets, bluegill, crappie or even walleye, the basic preparation is the same. Once you have washed your nice, clean filets make sure they're dry by blotting them with paper towel. In a gallon ziplock bag, pour in a generous amount of seasoned fish fry mix. We like to use Drakes fry mix but flour mixed with a few spices works just as well. Next, take your filets and drop them in the bag filled with fry mix. Shake the bag and evenly coat all of the filets you just dropped in. That's it.....your ready to fry! Once you have your cooking surface prepared it's time to start cooking fish over a campfire! Set the cast iron skillet over the hot fire and add about 1 inch of vegetable oil. Let the oil heat up in the pan for about 1 minute before adding any fish. You can also make up a tinfoil packet filled with you favorite side dish to cook while you're frying the fish. Once your oil is hot simply grab out a few filets from your bag filled with seasoning and add the filets to the hot oil. It's important to make sure you keep a hot fire......but not too hot or it will burn the grease. It really just takes a little practice but once you get the hang of it it's easy. By having a lot of small branches or kindling nearby you can quickly create a hot fire and heat up the oil if it gets too cold. Fry the fish filets for about 3 minutes on each side or until they are golden brown. Once done, use a pair of tongues and set the filets on a plate covered with paper towel to soak up any leftover grease. All that's left to do now is enjoy some fried fish! Frying fish over a campfire is a lot of fun. Plus, it's a great way to add excitement to an outdoor event by passing around a plateful of hot filets. To create the perfect meal just remember to make a good cooking platform, create a HOT fire and use a cast iron pan. Then just fry and enjoy!